Mega Thanks | 2P START! When the dreaded Tuesday night rolled around with nary a comic idea in sight, I was a bit worried that my determination to do a Thanksgiving comic would lead to some rather mediocre work, but I’m happy to say that this turned out to be one of the better jokes we’ve done in awhile. I always love comics that give a different spin or an alternate history of how things happened in various video games, and this certainly qualifies. It’s quite a fun way to imagine how the Robot Masters got into Wily’s hands as it casts Dr. Light in an entirely different…light. Anyway, have a wonderful Thanksgiving everyone! Here’s the reveal of some hidden detail I don’t expect you to find. Special thanks to reader GXEchidna for helping us come up with this joke. We seem to be on an odd streak lately of comics that look to redefine how you perceive characters and their intentions. I guess we have a never ending desire to turn basic premises upside down to see if comedy can fall out. Happy Thanksgiving, everyone. Rats. I didn’t get it… again. 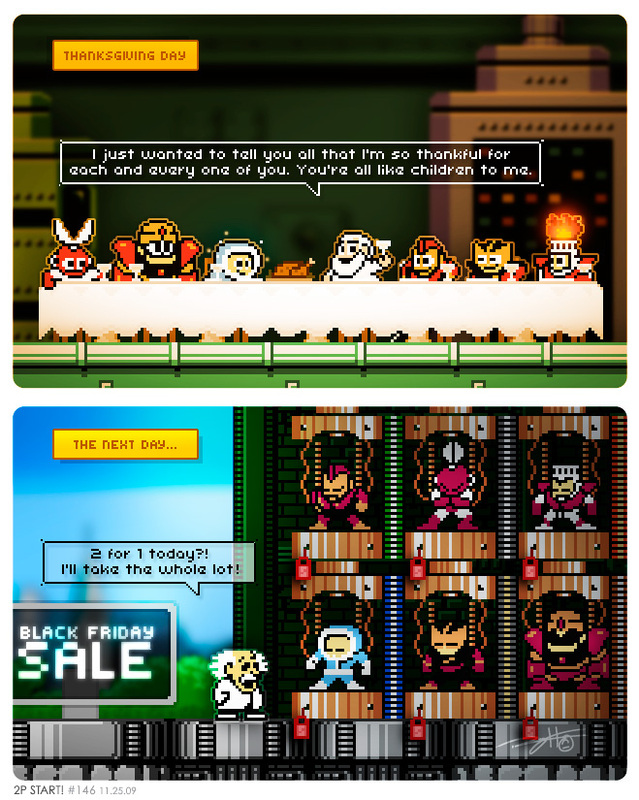 Easily the best Thanksgiving-related video-game comic I’ve ever read (granted I haven’t seen that many, but still). NCG! Oh ho ho! How devious! Truly this Dr. Wily really is an evil genius. For starters, note the lack of a crowd anywhere near him. No doubt he destroyed everyone else that’s been in line. Also, note the fact that it seems to be late morning. This means he’s been destroying people that dared to line up since before 6am; people that are too daft to notice or care about the crazy man with a giant doomsday mecha (not pictured), heedlessly heading on towards the shiny bright lights of savings, and thus to their doom! And, on top of all that, his face currently looks eerily similar to those dudes from Mischief Makers (ignoring the mustache). But all of this pales in comparison to his most diabolical scheme: saving 50% by switching to Geico by buying the entire stock of robots on Black Friday! Truly this is Ebeneezer Scrooge incarnate! So, just like the penguin comic two weeks ago, I find myself grinning at the (more subtle) dark humor here. Knowing the history of the Megaman series a bit made it easier to appreciate, since I’m aware many of the Megaman bosses tend to be originally created by Dr. Light. And I like how did the first scene. All the robot masters with Dr. Light, all happy and cheery (except Cutman looks a bit suspicious and worried). Eh, didn’t do anything for me. I’ll like it better after the inane details are explained on the podcast. Dr.Light is the one putting Mega man in o much pain he sold them on black Friday for money so Dr.Light is just like the toad from last week wow Dr.Light has like 100 more so a extra panel could be Dr.Wily walks a little more and finds mega man in a capsule so Dr.Light then should have a BAJILIAN dollars and he would be swimming in a pool of money just like you Tim. yeah, didn’t really work for me, maybe I just didn’t get it. I guess the joke is about selling children, but that just seems more sad than funny. I’m not a Megaman buff, but I think the enemies in each game are robots made by the guy who created Megaman (Dr. Light). They somehow get taken over and used by the bad guy, Dr. Wily, at the beginning of each game. The joke here isn’t so much about selling his kids, it’s more about how so many of his creations end up being used for evil. Clearly the most obvious answer is that he’s some kind of amoral weapons dealer… or something like that. I think a lot of people won’t get this comic though. Outside of the US there’s no thanksgiving and no black friday. With the Megaman knowledge needed (who the 2 white haired guys are) there’s just a little too much chance to miss the joke. I liked it. Not spectacular, but a nice little joke. Why do you choose to make every Mega Man comic a sprite comic, by the way? It’s seems like an odd choice for a comic that normally has such a distinct art style. i suppose you placed the robot masters in the order they appear at the “Stage select” screen, I only suspect that because I haven’t played MM1 that much and barely remember it (or was it because I never beaten one of those? meh) and every one of them have their respective weapon energy bar color. It’s an okay comic for me, have no idea what black Friday is, but it could explain how Wily got his hands on Light’s robots in the first place. I’d like to see a megaman comic in your usual drawing skills thought it might look strange since I only saw one non sprite megaman comic (arc to be more precise). And looking at that comic again, I can see how “Cold cold mountain” is still part of you humor, I mean, Light just sold his children, no blood, but still a tad dark isn’t it? Oh you silly Americans, celebrating Thanksgiving a month and a half late. I have to ask though…did Cutman carve the turkey? Do robots even eat Turkey? Maybe the robot mastes ate the turkey, then realized they weren’t designed to eat turkey, and broke giving Dr. Light the opportunity to sell them…but I digress. Why? Are you planning to sell your robotic creations to pay for it? That hidden bomb might have been what made Dr. Light sell his precious sons. Wow, these comments are surprising to me because I liked this one a lot. But I guess since I’m familiar with the (classic) Megaman characters and Thanksgiving/Black Friday, I had an edge. I was really hoping for a Thanksgiving comic and this one didn’t disappoint. I like how the first panel looks like the Last Supper. That panel alone would’ve been a pretty good comic in my opinion. But adding the second panel gave a new (and funny) twist on how Dr. Wily got a hold of these robots. Didn’t really get it. I’m never going to get your comics about NES era or earlier games. I rarely get the Pac-Man comics and I rarely get the Megaman comics and it took me a while to get the Mario Bros/Duck Hunt comic. Again, that’s not really a fault of yours though, but I can’t be the only one not getting these types of comics. Sorry, I’m not going to play games I don’t like just so I can get every single webcomic this site produces. O SNAP! Fight between D3vin and Roadjcat. I’m just recommending some good games. Although the Mega Man series might not be your forte. Shall I recommend a nice game of *insert game you hate the most here* ? Sorry, how caustic that sounded, but yeah, I just don’t really like older games. It’s more in line with how I like easy games, than with the actual age of the games. I am soooooooooooo sorry for not checking 2pstart earlier today. I’m going to NJ today to visit family for the holidays, and i knew there was something i had to do before i left the hotel. Now it’s 2:15 and I’m JUST getting to read 2pstart. I am sorry, and will from now on check 2pstart within an hour of getting up every morning. SNEScg. o yeah, one more thing that has been bothering me for a while. Why is the raybob industries logo in ray signature? The logo represents me and is used as an extension of my signature in all cases. Does that help at all? Ha ha, another good comic guys. Dr. Light always seemed like a jerk to me and this just confirms it. Clever clever. Even though I prefer it when the comics are drawn, you utilize sprites and special effects quite nicely in the MegaMan ones. I think it’s the colors. Anyway, NCG. Ha! This is great. I always did wonder how those robots got into Wily’s hands…. I dreamed of reading a 2p start comic, which is pretty similar to Cold, Cold Mountain. But the bloodstain are on a car, and people in the car looks… soulless. Nice comic guys and have a Happy Thanksgiving! Here’s to proper spelling of words like colour, and doughnut. Also to pronouncing the letter “zed”. Yes… It’s all very clear to me now. Dr. Light must be part of Toad’s Italian Mafia, whose goal is to make video game protagonists’ lives miserable for no reason whatsoever! First Mario, now Mega Man, who’s next? We must stop them, before every single video game protagonist has been demoralized! Of course! They must be tied to the syndicate that sent Navi and Slippy to Link and Fox! Gah! It all makes sense now! Curse those darned supporting characters! Well, no wonder his games are becoming more and more terrible, he always has someone yelling at him about “PRESSING ‘A’ TO JUMP!” That would certainly drive me to the brink of sanity. I lol’d at both jokes. This one makes up for the last one tremendously. And I’m surprised nobody has made the correlation between the hidden joke and project valkyrie…..
…Which means, Dr. Light is really Hitler, which makes Dr. Wily the good guy that’s trying to stop him. Which also means that Bomb Man (I think that’s his name) is really Tom Cruise trying to stop Hitler. Of course, we all know he lives an puts his robots up for sale the next day. Kind of like how everyone involved with the Valkyrie project was shot down. Yet another joke lost on me since I’m from the UK and therefore don’t celebrate Thanksgiving or know of Black Friday. Plus I’ve never played Mega Man. Epic fail on my part. This joke’s lost on many people including myself. All for we do not celebrate thanksgiving, i myself never played megaman either so yeah. Don’t get this one. Though the whole ‘You are my Children’ and the next day for sale is kind of funny. Y’know, that first panel reminds me of “The Last Supper” guess that makes Dr. Light Judas. By the way, feeling like an evil genius myself. I just scored Scribblenauts for $17 on Amazon.com during their Black Friday Sale! Better yet, my $10 credit from getting NSMB Wii went towards it, so it only cost $7! I didn’t have to deal with the roads or the crowds Friday at all! why dont gutsman & wily have eyes?